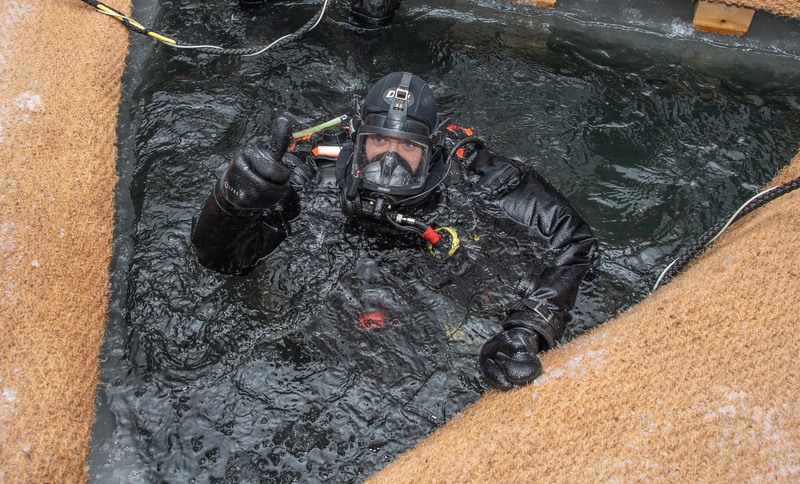 A diver shows a thumbs up to indicate he is okay after entering the arctic water during Operation NUNALIVUT in Tuktoyaktuk, NT on March 23, 2019. Military divers from Canada, Finland, Sweden and Norway work together to remove a block of ice freshly cut on the dive site during Operation NUNALIVUT in Tuktoyaktuk, NT on March 21, 2019. 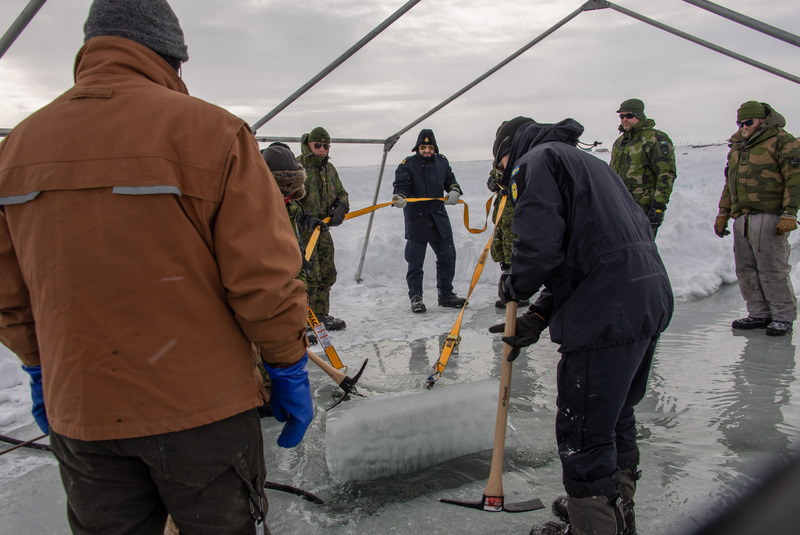 Clearance Divers, Combat Divers and Port Inspection Divers from across Canada have participated in Operation NANOOK-NUNALIVUT 19 in Tuktoyaktuk, Northwest Territories, from March 20 to April 1, 2019. They were diving in the glacial waters of northern Canada with colleagues and military divers from France, Finland, Sweden and Norway. International representatives were first welcomed to the Fleet Diving Unit (Atlantic) (FDU(A)) in Halifax, Nova Scotia. While there they were provided an opportunity to get to know each other and trial the different equipment. The group of about 50 people then flew to Inuvik, a two-hour drive from Tuktoyaktuk. “We are proud to be at the helm of the diving activities for this operation. Once the divers put on their equipment, whether they are Canadian, French or Norwegian, they are one team. Especially in such conditions, they must to rely on each other.” said LCdr Patrick Fournier, Commander Task Force Dive and FDU(A) Commander. Military divers are recognized for their professionalism and expertise. For the duration of the operation, they explored the seabed to a maximum depth of 17 meters and practiced their skills under the ice using a new piece of diving equipment, the Ultra Light Surface Supplied Diving System. The Defense Research and Development Canada and Joint Arctic Experiment teams also performed various thermal retention experiments on divers. LCdr Kharim Schliewinsky, Advanced Diving Medical Officer, was the CAF’s Senior Medical Authority in Tuktoyaktuk and was prepared to provide medical coverage if any diving incident occurs. The members of the 1st Canadian Ranger Patrol Group were also part of the team to provide good advice and facilitate a smooth integration into an arctic environment. While there, military members had the chance to meet Tuktoyaktuk residents and learn about Inuit culture and traditions.